Nestled beside the emerald waters of world-famous Batu Feringgi Beach, Shangri-La's Rasa Sayang Resort and Spa offers an expansive luxury retreat in traditional Malaysian style. 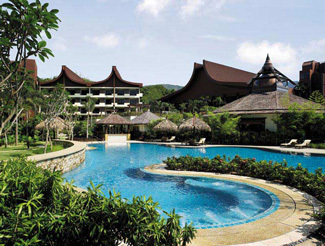 This Penang beach resort offers its guests a luxurious accommodation option replete with an array of amenities whilst situated amidst impressive and majestic scenery. 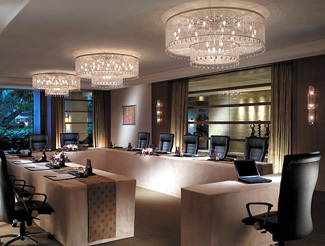 The resort is an ideal location for executive retreats and conferences. The Pelangi Ballroom has been intelligently linked to 14 other variously sized meeting and function rooms, and can accommodate 400 people for a banquet. The ballroom has direct access to the car park area. Our state-of-the-art audiovisual equipment includes a satellite TV conferencing facility, electronic projection, simultaneous microphone and PA systems, remote control screens and built-in sound systems. Click here for accommodation options and location information.